Did you know you can list all the documents related to a debtor or creditor account in EXO? 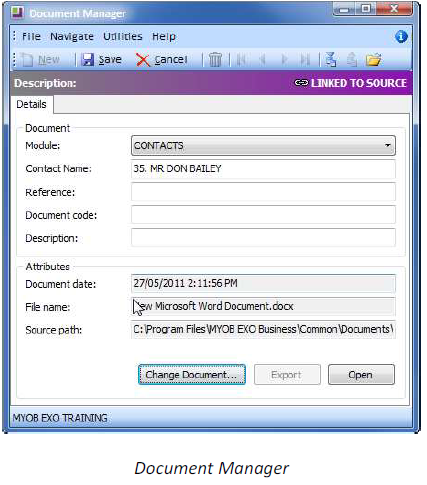 It could be a word processing document, a graphics file, or any document that is recognised by a Windows application. When sending e-mails from EXO Business, users also have the option to save a copy of the email in the corresponding debtor’s Documents tab. E-mails from Microsoft Outlook can also be dragged and dropped into the Documents tab. (using less memory) or saved into the database (more memory). 1. Open the Docs tab on the Contact screen. 2. Click on the icon and then on New. 3. Click on the icon on the toolbar. 4. Navigate to the document you wish to import and double-click to open. • Save file to database. and source path will be automatically entered). opened and edited as required. If you have important emails you have received from a client or supplier you can easily drag and drop them into the Debtor or Creditor file. 1. Open up the particular debtor or creditor you would like to save the email to. 3. Select the email within your inbox, select and hold the left mouse click and drag into EXO. 4. 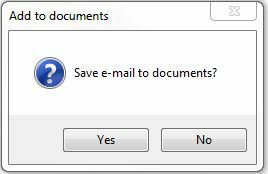 It will then prompt you by asking if you would like to save the document, select YES. If you need any assistance please contact us on 03 9899 2710.